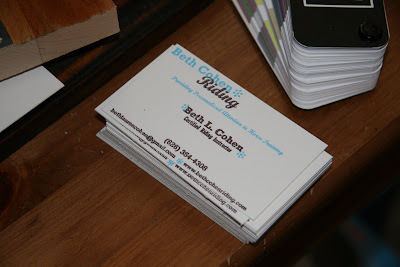 Anyhow, like the Beth Cohen Riding business cards, the Joie Studio design is a 2 color concept, with the four Joie dragonflies in the back in a light pink and the text in front in a deep red color. I also printed this on Crane's 179lb cover in pearl white. This design is a lot easier than Beth's since the second color will lay on top of the first color -- no need for exact registration as in Beth's design. Here is the final product! 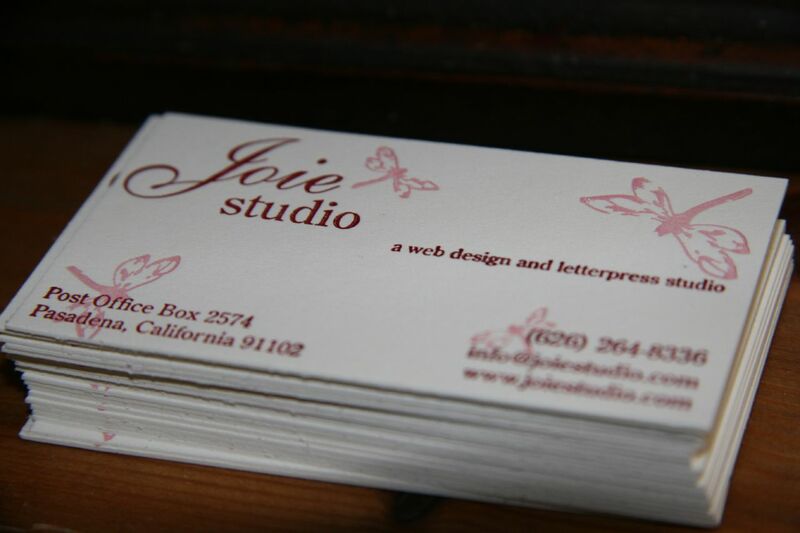 Now, to get started on setting up the email address before anyone tries to email Joie Studio! 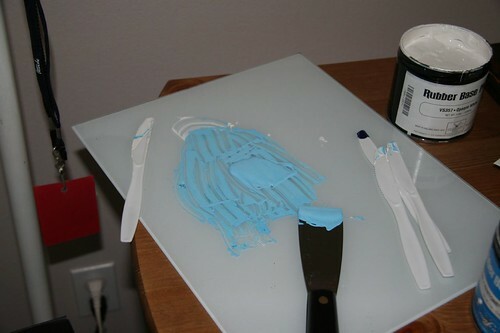 To do this, I had two plates made, one for the blue (PMS 306) and one for the brown (PMS 4705). 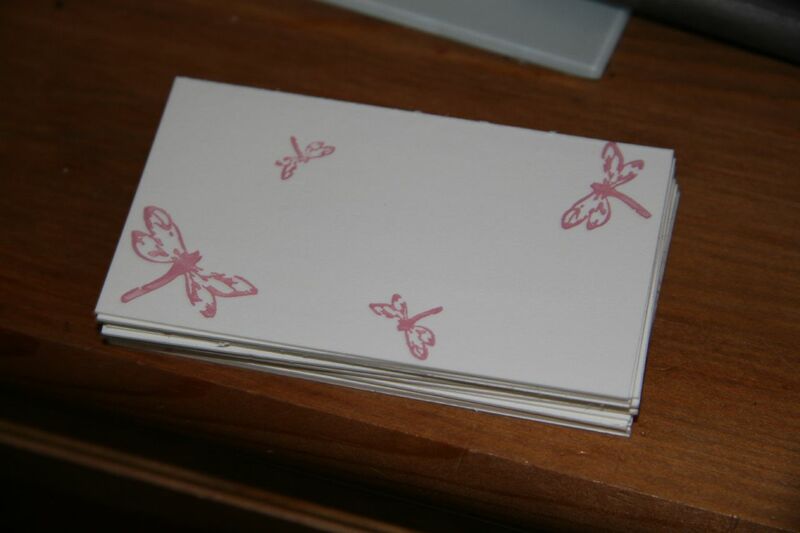 I decided on Crane's 179lb cover in pearl white for the business cards. I custom mixed the colors and set out to print. 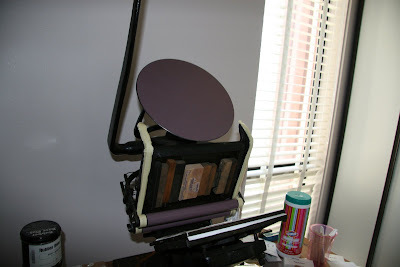 After the first color had dried (with rubber based ink, about 2 days in sunny southern California), I started up the press with brown. Generally, you don't want to print the second color while the first color is still wet (the term for this, I believe, is "wet on wet") because there's a chance that the colors will mix and mess up your whole print job. Especially with this color combination. 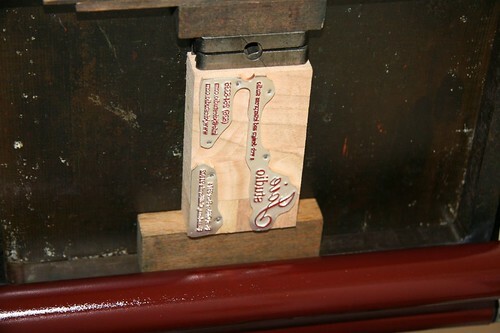 Again, the hardest part of the brown step was the alignment and setting the gauge pins correctly. There was a great discussion on Briarpress on inks, and one posting had a great technique at measuring out the different colors for mixing. Jason used "dabs" to count out the different color parts. I used this technique in mixing the more complex custom mixes, although I do have to say that I did a fair amount of "eyeballing" as well. I mixed the colors for three of my current projects, below. The first row is for a wedding invitation, the second is for a set of business cards for my client, and the third is for Joie Studio's business cards. 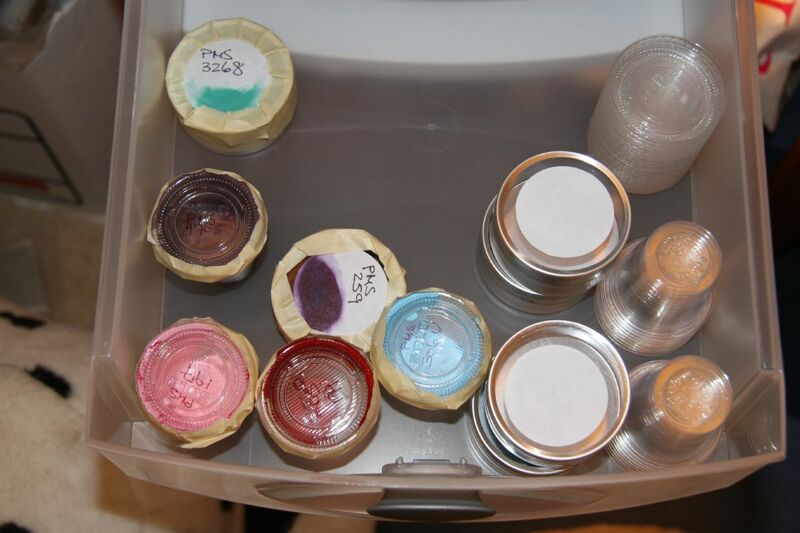 Finding containers to store the custom mixes has been an interesting scavenger hunt. Dave Celani talks about using 4 oz cans and 5 oz tubes to store ink, but the amount I'm making is significantly smaller than 4 or 5 ounces. At letterpress class, we use old film canisters, but as I've completely switched to a digital photography setup here, that doesn't quite work out. I did find at a local restaurant supply store and a local craft store (Michael's!) some good storage options. For small amounts of ink that I want to save, I bought those little plastic containers and caps that to-go places put sauces in (about $5 for over 100 containers). These hold, according to the bag, 1.25 oz. I use a thin-tipped Sharpie to write the Pantone color number on the lid. I also bought wedding favor tins from my local craft store (Michael's, though I've seen them everywhere, including Target in the wedding section), which hold about twice as much as those little plastic containers. The wedding favor tins (about $20 for 30) have a clear top and also come with labels. 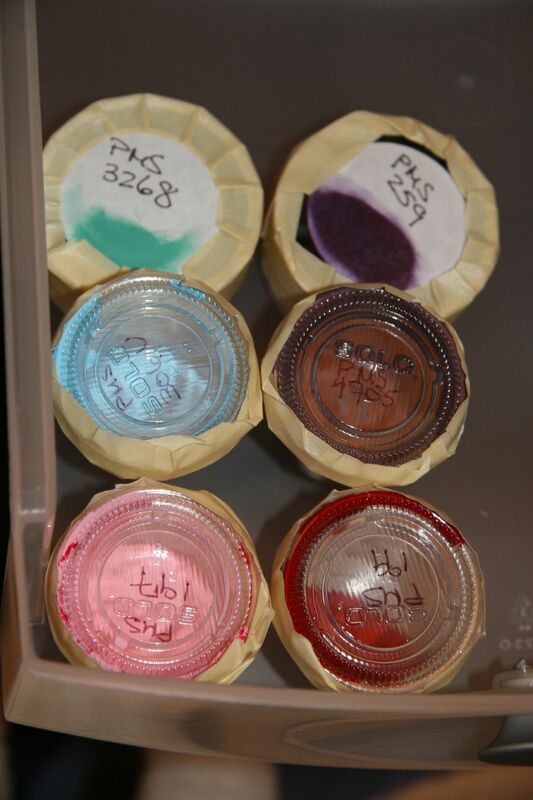 I used the labels to smear some of the ink on and to write the Pantone number on. I tape these containers up so as to keep air out as much as possible. 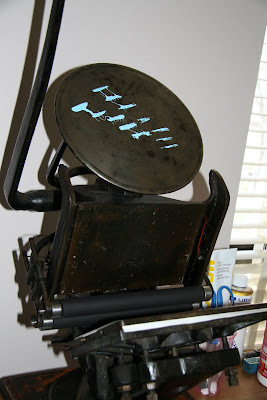 I am going to trade ink with a friend of mine who is also setting up a letterpress studio. We've bought some 4 oz cans and we luckily haven't had too much overlap yet on what colors we've bought because it would take either of us years to finish one of those cans of color! After I got the equipment to lock up my chase, I put some sample black ink that I received on the Golding Official and set out to calibrate the impression. I also tested out how printing on coated stock would turn out. I used a snail cut I had made awhile ago and printed on A7 Stardream quartz card (pictured above). 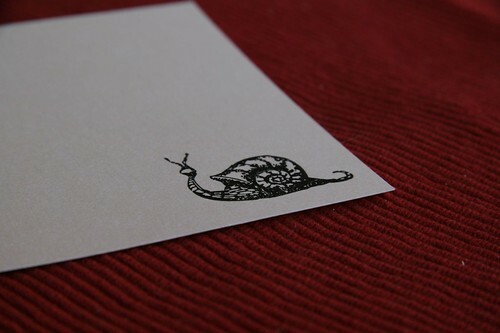 It made for a very cute "snail mail" card! On my second test run, I used metallic gold oil-based ink I had bought from Accent Ink and printed the set type Dave Churchman had sent me (pictured above). It turned out beautifully! Thanks again, Dave! I also printed out parts of some other projects with the metallic gold, which I'll show later when they are done! I found the printer's cut for this design awhile ago, but there hasn't been a chance to print it. 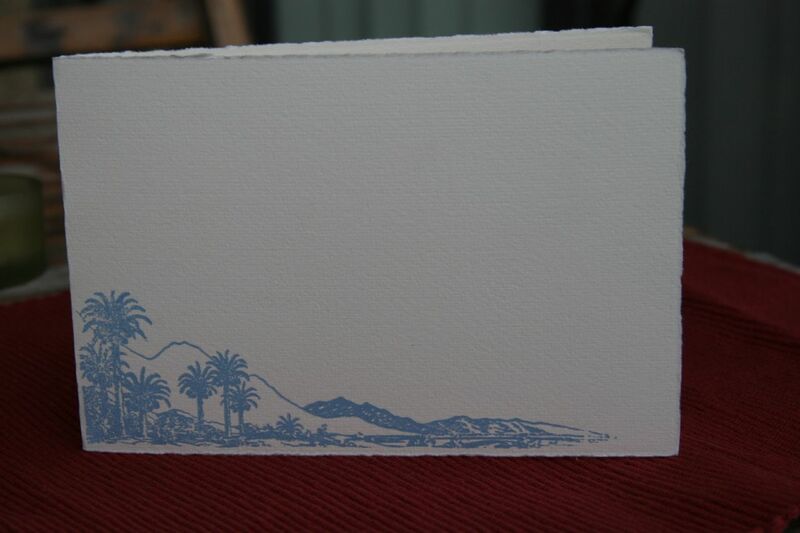 When light blue when onto the Vandercook, I took a chance at the color with this print. I think it came out beautifully! 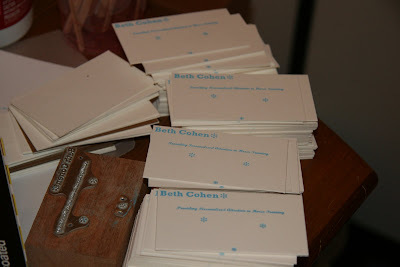 The color reminds me of the Pacific Ocean, and I call it the "Malibu" card. 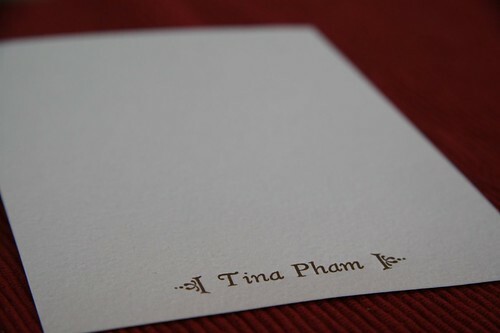 I letterpressed it onto the rest of the Fabriano Medioevalis cardstock that I had left over. I'm trying to decide whether or not to add some text in the whitespace above the print. 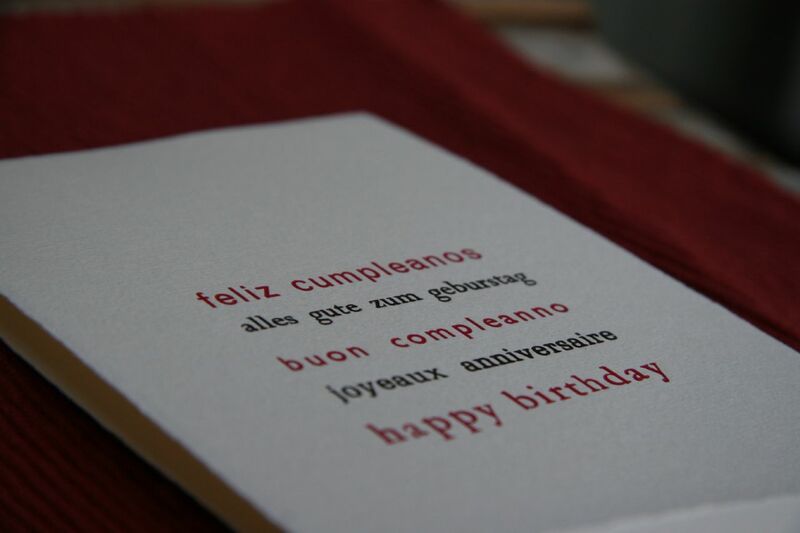 As another exercise in typesetting, in addition to the "Many Thanks" card, I set a "Happy Birthday" multilingual card as well. I decided I wanted to alternate between a bright pink color and a chocolate brown. This is the first time I've tried such exacting registration between two colors, and I wish I had set it to alternately justify left and right instead of justified center that I did. I didn't have an accent for the "n" in the Spanish and there are some letterpress quirks in the typesetting, but I believe it came out beautifully. 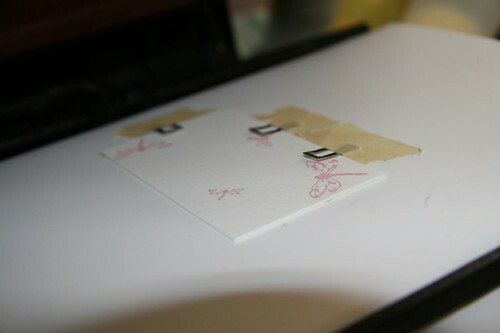 The Fabriano Medioevalis cardstock takes impression quite well (check out the bigger version of the pictures to see it). 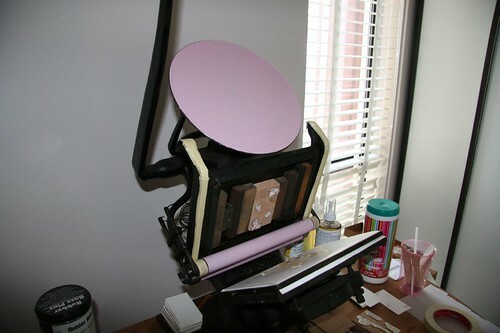 The cornerstone to original letterpress artwork is having plates made. Not that I've worked with anyone else to have my plates made for letterpress, but I love working with Owosso Graphic Arts. I don't know how they compare to photopolymer plates since no one I know uses both metal and photopolymer plates, but I'm sure that there are advantages and disadvantages to either type of plate. In addition to having lightning fast turnaround (same day for magnesium plates if you get it in by 10am Eastern), I just learned two great things about ordering from Owosso Graphic Arts. 1. On a two color vector image, you can leave the entire file intact and they will be able to separate out the two colors and make a different die for each color. 2. 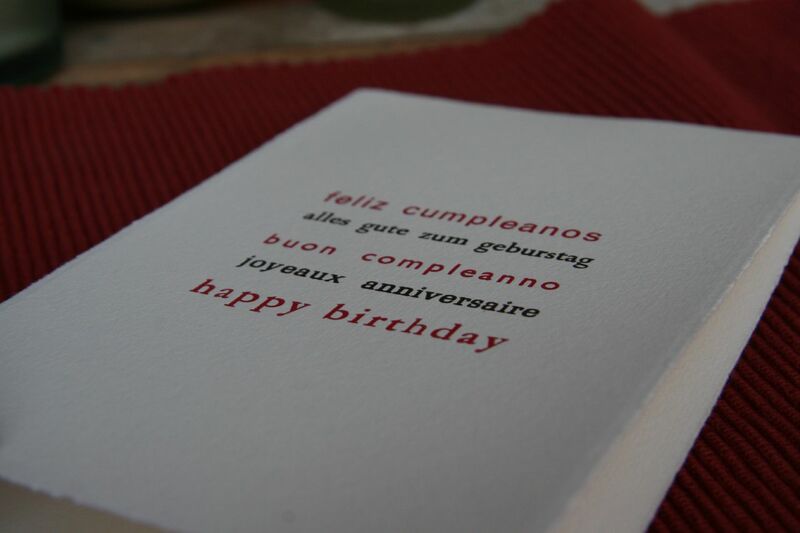 This I learned from one of my classmates in my letterpress class. You can also save money on plates by laying out all the different plates you want made into a single file and submitting it as a single plate that needs to be cut into different pieces (the cut charge on wood-mounted magnesium is 60 cents per cut). I'm going to do a more detailed post on this later when I have more time. Basically, I saved about 40% by submitting four plates as one plate that needed to be cut instead of submitting them as four different plates. Call Owosso directly (800-444-5552) if you have any questions about the best way to submit your artwork. They are super helpful and responsive, especially over the phone.